This is a Troy Battlemag AR15/M16 Black 30rd. Magazine. Battle ready gear demands the highest standard of ruggedness, reliability and performance. That standard is reflected in every detail of the leading edge Troy Battlemag. Troy developed a proprietary military-grade, chemical, biological and impact resistant polymer specifically for this magazine. The feed lips and anti-tilt follower are reinforced for strength. A bolstered floor plate is set flush so that it will not catch on other mags when pulled from a pouch, saving crucial seconds when executing mag changes. Engineered to function flawlessly with all AR15/M16, M4, HK416 and FN Scar rifles and carbines. Comes with flush and shock absorbing extended floor plate lock, which doubles as a magazine pull assist. Lifetime limited warranty and made in the U.S.A. Excellent magazines. 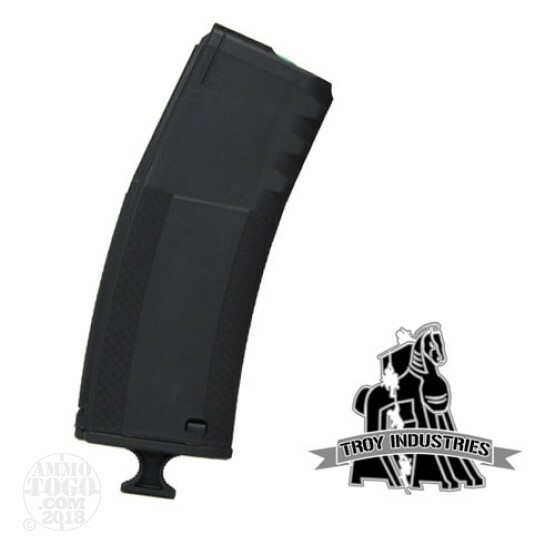 They are thinner than PMAGs, therefore they usually slide right out of the AR mag wells by simply pressing the mag release. Never experienced FTF with these mags.